This ¾” thick clear optic crystal is framed on one side and along the bottom by solid black crystal. The clear crystal is beveled both front and back, so the black can go on either side. Personalize the large engraving area of this stunning design to recognize and honor the top achievers and milestone events of your organization. This premier crystal is packaged in a velvet lined presentation box. This beautiful award is 1" thick and free-standing. 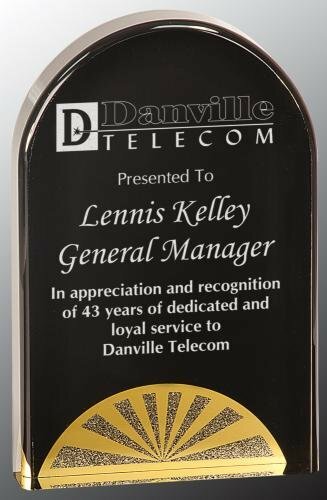 The Hydrofoil graphics provide the one piece acrylic the look of a black marbleized base, and with plenty of room for your personalization, this is a stunning way to recognize and honor the highest achievements. create a striking token of recognition or personalized gift. acrylic award. The clear acrylic fan is framed by gold borders, and serves to frame and highlight the solid black interior fan design. The entire acrylic piece is supported by a black iron stand, and the combination creates an overall stunningly unique award. Personalize the black fan area for your event for a recognition of excellence that will be proudly received and displayed. This 3/8” thick clear polished acrylic plaque comes with a white self -adhesive hanging attachment that placed on the back of the plaque really makes your personalization stand out. The rich black marble engraving area is framed by a sleek black border for an elegant, modern recognition of excellence.